I’ve posted a cinnamon bun recipe before, it was two summers ago and at that point I was a novice to yeast (still am a novice to yeast). I remember, as I was slicing through the longest piece of cinnamon encrusted ‘rolly polly’ I had ever seen, being so bloody proud of myself at having managed to transform dried balls of active yeast into a pillowy soft sheet of raw dough, which was just moments away from being the best thing I’d ever made. These buns are much, much richer than those bite sized ones. These are the sort of buns you might sink your teeth into at a certain chain bakery. Yes, these are definitely the kind of bun you would find at Cinnabon. And yes, that is definitely a good thing. Happy Thanksgiving! Note: If you're in a hurry, you can skip the overnight chilling step. This just brings out a yeastier flavour in the bun which I kinda prefer. Instead, just proof the raw buns in a warm place for 2 hours and then bake. In the bowl of a freestanding mixer fitted with the dough hook (or a large bowl) add water, yeast and 1tbsp of the sugar. Let stand for 10 minutes until the yeast starts to froth. In a jug mix together the buttermilk, egg and oil, then pour into the yeast along with the rest of the sugar and mix until combined. Stir through 2 and a 1/2 cups of the flour plus the salt, then gradually add the rest of the flour whilst mixing. Knead for 5 minutes, until the dough comes away from the bowl and does not stick to your fingers. Place in an oiled bowl, cover and let proof for 2 hours. In a small bowl mix together the filling ingredients except the butter and set aside. Roll the dough out aprox 30cm by 40cm and brush with melted butter, making sure to leave 1 inch around the sides. Sprinkle filling mixture over the butter. Tightly roll the dough from the shorter side (to make thicker buns) and pinch the ends together to stop the filling from spilling out. Score dough every 1.5 inches and slice through. Place buns in a lined brownie ban, it doesn't matter if the buns are touching each other. Wrap pan in cling film and refrigerate overnight and/or up to 16 hours. Fill a jar with boiling water and place on the bottom shelf of the oven. Put the buns on the top shelf and let proof for half hour. Take the water and the buns out of the oven of the oven. Preheat the oven to 180°C/fan160°C/gas 4. and bake for 30 minutes, until golden brown. Let buns cool and prepare topping. Whisk all of the ingredients together until smooth and runny. Pour over buns once slightly cooled. Best eaten the day they are baked, but lasts for 3 days! Clearly this bun had some self image issues. Look at the way its erecting out of the pan trying to get me to take a close up shot of it! Selfish bun. These look delicious! I was looking for a christmas morning breakfast recipe and I think this might be it. Thanks. When you come to the states, you wouldn't mind dropping a pan of these off at my house, right? Great. See you soon. I have just pinned this it looks so good! Hahaha love your commentary. Mmmmmm -- anytime someone compares something to Cinnabon I'm hooked. Love the look of these (so much luscious dark cinnamon!) Thanks for posting this! Hi-- These rolls look perfect! Quick question: do you leave the buns in the oven while it is preheating? I'm just a bit confused about the baking instructions and want to get it right. Oh my gosh, they look amazing! 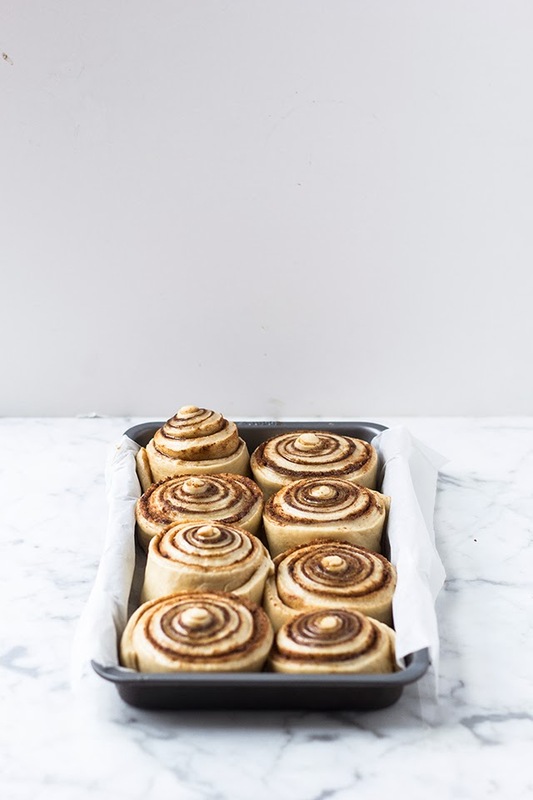 I love cinnamon buns so much! Hi Shannon! So sorry for the confusion. I'v updated the recipe, thank you for letting me know that it confused you! It's a shame you wont be in New York when I am! Looks amazing! Do you think they'd be able to be made ahead and frozen? Thanks! My pictures definitely didn't do these justice but yours definitely do! Seriously, gorgeous photography! Love the suggestion about freezing them. So, after they've been rolled, cut, refrigerated overnight and proofed a second time is when to put them in the freezer. I will definitely be making these again - they were wonderful this snowy weekend. Just a mention, after reading, re-reading and re-reading again, there is no mention in the directions of where or when to add the salt in the ingredients list. I'm assuming it would be with the flour, but wasn't sure and managed to omit. Totally creeping through your blog. Apparently I've commented on these before but jeez, they really do look amazing. That dough, dude! Gorgeous. What is caster sugar? And is there a substitute for it? Caster sugar is super fine granulated sugar! You could try adding granulated sugar to a food processor and whizzing until fine. 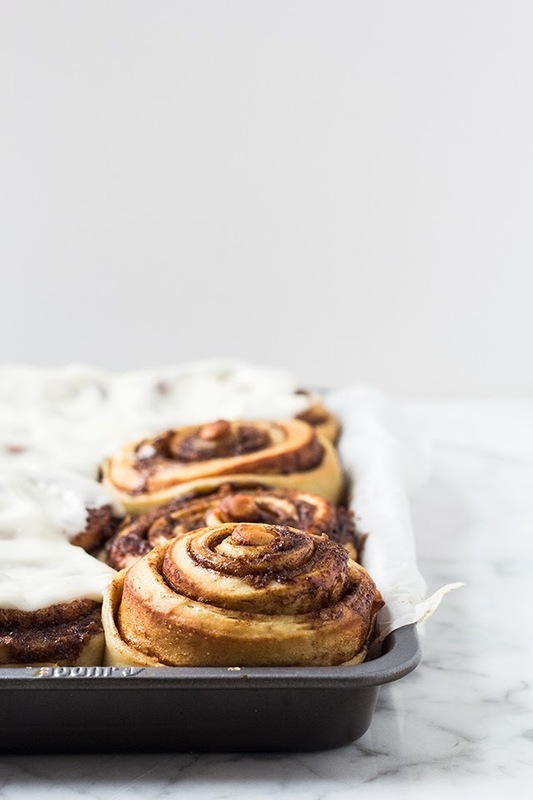 This is my go to recipe for Christmas cinnamon buns for three years in a row. 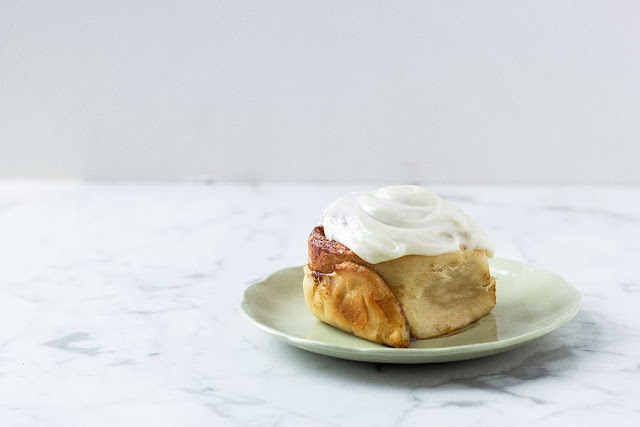 They are the best-- and soooo much better than "tube" cinnamon buns. Will keep this a family tradition for years. Thank you so much for sharing! Hello! 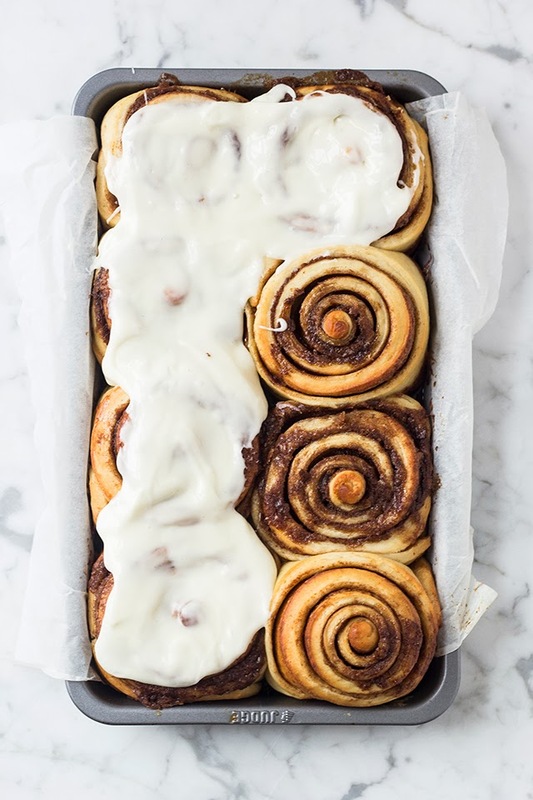 The recipe is great and since I tried your recipe are my favorite cinnamon rolls, but I do not have so beautiful, I think it's the size of my pan trying, could you tell me how big is yours? Thank you! Hi Gabrielle - glad you like the recipe and very happy to hear they're a fave of yours! The pan I've used here is 12x7 inches. 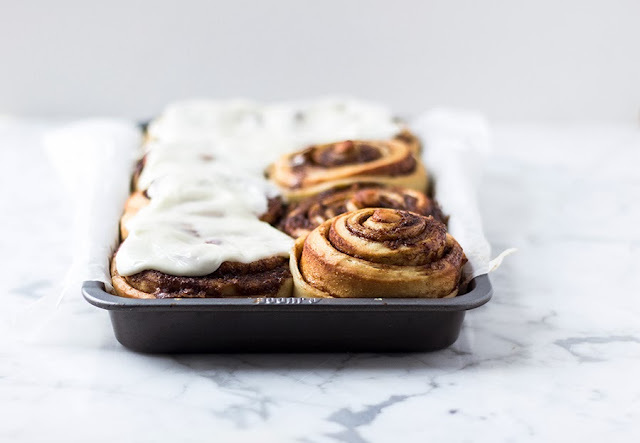 If you don't have a pan thats the right size, you can put the buns in two trays, the buns need to be spaced apart by about 1 inch before they rise.